I have a really weird quirk. Well, really, it’s more like an entirely useless superpower, which nevertheless occasionally freaks people out and always inspires disbelief. I’ve had it literally my whole life, and no, I cannot teach you how to do it. I’m not even really sure how I do it. It’s not intentional. I will literally just be walking down a street, lost in my own head, when there’s a little tick at the back of my mind that draws my eye to the nearest clover patch where, invariably, I find a four leaf clover. Sometimes I find more than one four leaf clover. One time, I found 36 of them in a single patch*. I find them so frequently that I’ve taken to distributing them to strangers on the street, who are often weirdly suspicious of me for doing it, like handing them a superstitious symbol of good luck is somehow the first stage in an evil scheme to take over the world. 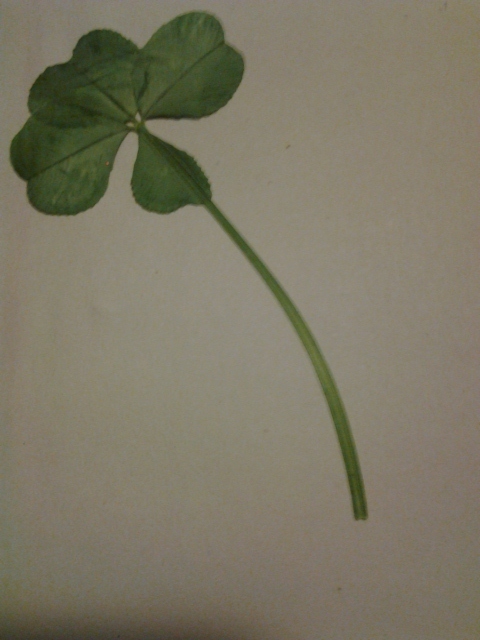 When I was little, I knew which patches around my house would reliably turn up clovers, and whenever my parents had guests over I use to have them time me while I ran out into the yard and fetched them a little luck. But four-leaf clovers weren’t the only abnormalities I found. Just as I found the four-leafers with alarming frequency, I also found five- and six- and even seven-leaf clovers. And while I was never particularly superstitious as a child, I had very much internalized the idea that four-leaf clovers were good luck, which begs the question: what do the extra leaves on the fives and sixes mean? Being an imaginative child, the explanation I settled on was this: for every extra leaf, beyond four, you get to make a wish. For that wish to come true, you have to wish on the clover, pluck off an extra leaf, and then blow it into the wind. This made perfect sense to me because, after all, isn’t that what you do with dandelions and eyelashes and birthday candles? In its own childish way, the logic seemed to follow. Of course, I don’t believe this any more. At least, not in the literal sense. I continue to find four-leaf clovers with alarming regularity, but now I simply regard them as a fond reminder of how lucky I am just to exist, much less have all the amazing things I have. It’s a nice way to keep things in perspective. But sometimes, I wish I could still believe in that childhood superstition, when all I had to do when I wanted something was find a clover with more than four leaves. Thinking about this, it occurs to me that kids don’t get enough credit for how genius their ideas are. What adults recognize as absurd fancy is often actually a really cool idea. For example, a friend of mine once told me that, when he was a child, he firmly believed that every time you blinked, something in the back of your mind took a picture. Then, once your life was over, you would get to watch a slideshow of all of those stored-up moments–the things you didn’t get to see when you were alive, because your eyes were closed for that millisecond. This lead him to a strange mannerism where he would blink extra whenever he saw something particularly beautiful, or when he was really enjoying an experience; he wanted more pictures of it. Doesn’t that idea just make you want to write a book? So, I’m curious. What childhood superstitions did you have? Do you wish you still believed in them? *Finding more than one four leaf clover in a single patch is actually quite common, because the multiple leaves develop as a result of impurities in the soil. Where there’s one, there are probably more, since all of those clovers are growing out of the same soil. Basically, they’re mutations. Science! A more useless superpower is being really really amazingly good at finding three leaf clovers. I believed I had to flush the toilet, wash my hands, and get out of the bathroom before the toilet tank refilled or else some sort of badness would happen. My daughter, who is the most like me of my three toilet-trained children, does the same thing.I think we just look for new challenges when we’ve conquered our latest stepping stone.